Our administrators keep on finding the latest and best promotions from everywhere, if you have promotion or ramadhan buffer that we don't have yet, why not let us know and share it to others? During this Ramadhan season, GoEatOut traffic has boost up significantly to a record breaking amount. We have to thank all of you for visiting and supporting GoEatOut, especially bloggers that introduce GoEatOut to their readers. However, we actually found that there are few bloggers out there copying the promotions directly from the website. While we don't mind sharing the good things to all of us, we would appreciate if you could give a link back to GoEatOut to credit the hard work that we have done. If would be best if you don't link the photo directly from us due to content legitimacy and privacy issues. Changes on our website might actually broken your copied content. ...and now you can "like" the promotion and restaurant and share it to your friends via Facebook! Visit GoEatOut now to find where to eat out later! 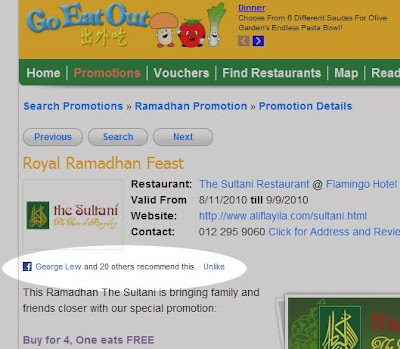 Don't forget to check out Ramadhan Buffet Promotions and share it to your friends and family!